Sound familiar? What is your line? What do you hear most often? Which is your favorite excuse for not developing people to their fullest potential? Delivering employee development seems to become more complex with the growing number of options and suppliers out there. Many of us in roles that involve employee development responsibilities can feel overwhelmed or intimidated by limited time, budgets, resources, and the increasing noise about the number of learning opportunities and options available. Let me share three surprising truths about why money should not even be in the equation when you’re making decisions about employee development. Then, I’ll share with you a great opportunity to not only generate multiple, creative, and cheap ideas for how to develop your people, but actually build bullet-proof strategies for easily and quickly implement them in your organization with stakeholder support in my upcoming intensive workshop on Employee Development on a Shoestring. First, here are my three truths about why money shouldn’t enter into your employee development equation. #1: It’s your job. Period. Developing people is your job regardless of your organization type or budgetary realities. It is not optional. We cannot simply dismiss it because there is no money – we need to always be developing others. So, it’s your job to figure out ways to do it that fit your situation. When employees feel that their skills are not being developed, they are much more likely to leave in search of more nourishing pastures. #2: You’re creative. Figure it out. Budget is not an obstacle if you approach employee development more creatively and strategically. Think outside the box and outside the classroom and you’ll be amazed at the sheer number of ideas you can come up with that can help any employee achieve any development goal in a way that doesn’t require an official learning event or program. Most of us undermine our own creativity and allow ourselves to be blocked by self-imposed limitations. I really believe the possibilities are endless, and one of my passionate missions is to help others believe it, too. #3: Development plans should not come out of a class catalog. When you take money out of the development equation and think about matching development needs to learning styles and contextual constraints, you can creatively devise no-cost or low-cost non-training ways to meet those needs. Training is great, don’t take me the wrong way. It’s just not the only way. It’s often not even the right answer to many development needs. Many of us have heard about the 70-20-10 Development Rule that says that the bulk of employee development does, and should, happen in on-the-job learning and through interactions with coaches, mentors, and peers. So by expanding our horizons of what constitutes employee development from the narrow slice of formal learning and into the full pie of holistic learning, we grow the list of possibilities exponentially. Do you want to figure out a specific approach that you can implement easily, with limited resources, quickly and cheaply? I can even help you devise strategies for gaining buy-in from key stakeholders so that your plans have a better chance of succeeding. Join me in the DC area for an intensive, hands-on workshop that is designed to help you develop employees no matter your budget, regardless or your organizational constraints, and despite any obstacles that seem to block your success. Moreover, you’ll engage in an interactive experience with lots of other peers who are facing similar challenges in discussions, exercises, and peer coaching activities that will expand your view of possibilities and will help you create solid, implementation-ready plans that you can implement right away, as soon as you leave the workshop. I hope you will join me for this fun and educational experience that has been designed with you in mind. 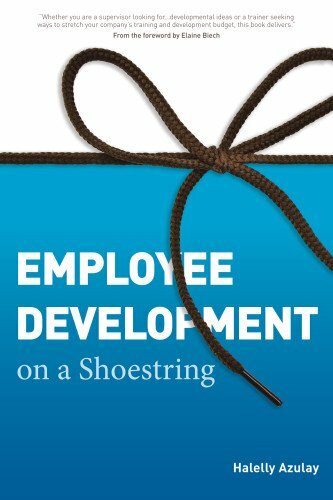 For more information and to register, please visit the workshop’s official page here:Employee Development on a Shoestring Workshop. I hope to see you in March! Cross-posted with ASTD.org here and here. Employee Development Outside the Box!